Dharun Ravi received his verdict today. It remains to be seen whether this will help prevent future cyber-bullying or related harassment. 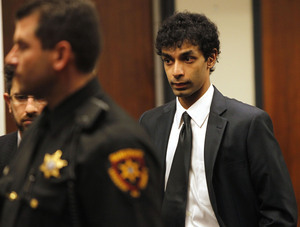 Dharun was charged on 15 counts, including bias intimidation and witness tampering, for using a webcam to spy on his roommate Tyler Clementi having a sexual encounter with another man. Clementi committed suicide just days after. After much public speculation and debate, Dharun has been sentenced to 30 days in jail, three years of probation, and 300 hours of community service. He was also ordered to receive counseling and to pay $10,000 to an organization which helps victims of bias crimes. The judge recommended that Dharun not be deported. Dharun could have received up to 10 years in prison—but even the prosecution, Tyler’s parents, and the man, known as M.B., who Tyler was with on the webcam, didn’t think that would help. Surely whatever sentence Dharun received is likely to be unsatisfying to Tyler’s family and friends. Dharun was not able to apologize to Tyler. He couldn’t promise Tyler that he would never do such a cruel thing again. He didn’t have that opportunity because Tyler killed himself after the incident. But Dharun should be expected to apologize for his actions more broadly. He should be expected to do more than contribute money to an organization that helps victims of bias crimes. If his community service is to be meaningful, he should do what he can to help prevent others from doing what he did to Tyler. Dharun, like Tyler, came from schools where students are called gay everyday—if they are too good at academics, too bad at sports, too skinny, too chubby, or too kind to girls. In most of our school cultures boys are expected to demonstrate their manhood by bragging about their sexual exploits with girls and/or by using violence against anyone who threatens their reputation—especially by associating them with homosexuality. If this kind of environment, this bully society, is allowed to persist in schools, we will surely see more cyber-bullying and school building bullying of the kind Tyler experienced. Dharun should do as much as he can to stem this tide. On Fox 5 this morning, Greg Kelly asked me: Isn’t Ravi too immature to be a leader, to help build the kind of community you are talking about? My answer is no. Dharun could and should be held accountable for his actions by being expected to teach other students how important it is to respect others. Instead of just locking another bully in prison for any amount of time, or suspending another one from school, Dharun should be expected to help change the culture that created him—that led him to be so hurtful and heterosexist towards Tyler. It wasn’t just Dharun that was at fault in this crime—but our society too that allows gay-bashing in schools to exist as a normal part of our students’ everyday lives. Students with school faculty, parents, and members of their larger community can make a difference—by calling meetings, by supporting students no matter how they express their gender and sexuality, and by making it normal and expected for kids to support one another. Dharun should help lead this transformation. I know that bully societies can be transformed into compassionate communities—and I know that students you would never expect to make a difference can be powerful and effective leaders if they are given the opportunity to take responsibility for making a difference. I know this can happen—not just because I’ve done the research—but because I’ve been on school faculty that helped create it. I’ve seen students who were homeless, who were sexually and otherwise abused, and from violent families, drug-ridden neighborhoods, and from gangs, become phenomenal leaders in creating change in their schools. Dharun came from an intact family. He was attending a fine university and he is considered smart and capable. He should be expected to use his privilege, his education, and his abilities to help change schools so that it is less likely another youth will be bullied—and called gay in a pejorative way—whether they are identified as homosexual or not. This is the kind of community service Dharun is capable of doing and should be expected to lead. Anything unrelated to changing the bully society in our schools is otherwise a waste of everyone’s time—and does little to make Dharun accountable for his actions.